The structure indicated is the epineurium of a nerve. The endoneurium is a delicate layer of connective tissue which surrounds individual axons. 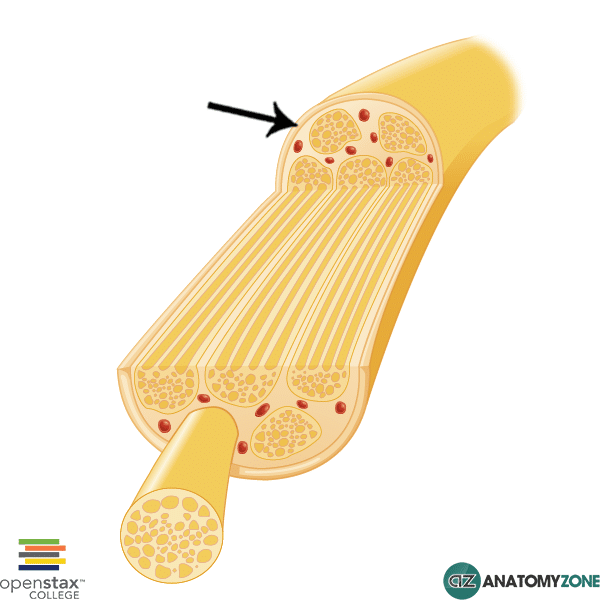 Collections of axons are known as nerve fascicles; the perineurium surrounds each nerve fascicle, and consists of several concentric layers. The epineurium is the outermost layer of connective tissue which encloses the whole nerve. It is composed of dense irregular connective tissue and encloses all the nerve fascicles together with any blood vessels which supply the nerve.